Verve Sports Bag is highly functional for cheer teams, the ball field, on the water, at the gym wherever sports are taking place. mesh water bottle holder, extra sturdy double grab handles and adjustable shoulder strap. 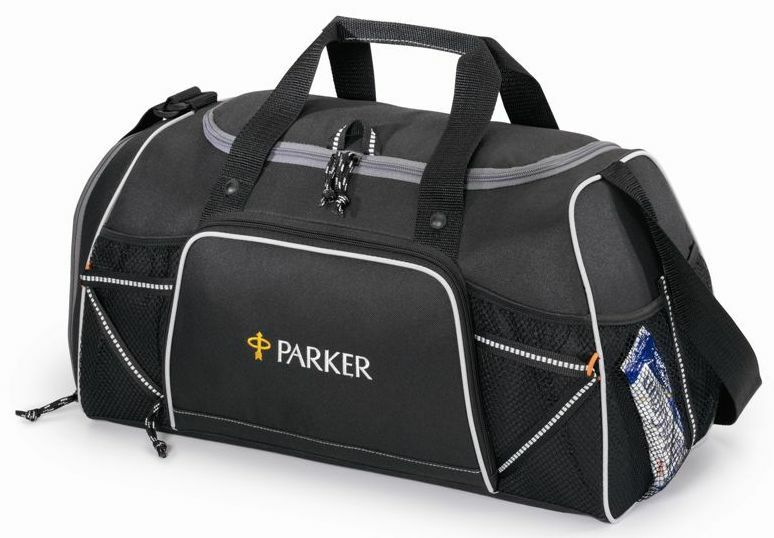 Overall size of the sports bag is 19" wide x 11" high x 9 1/2" deep. Price includes a one color imprint on the front center in an area 7" w x 4 1/2" h.
imprint color, add a screen and a running charge of $.99 each. The Verve Sports bag has a max of a three color imprint. Embroidery on the front pocket center is available in an area 4 1/2" diameter.